How to Set Up Online 529 Gifting in 4 Easy Steps! Let’s start off with a quick survey. Raise your hand if you’re saving in a U.Fund 529 College Investing Plan. If your hand is raised, take that hand and pat yourself on the back for the progress you’re already making in preparing for your child’s future college costs. If your hand isn’t raised, no problem! Pop over to our post here to find out how to easily set up a U.Fund account. Let’s do another quick survey: Raise your hand if your child receives checks from family or friends for birthdays, holidays, and other celebrations. My guess is that if we were in an auditorium, a lot of hands would be up. Wouldn’t it be easy if your family and friends could automatically deposit their monetary gifts into a college savings account for your child? If you’re saving in a U.Fund, you may or may not know that there’s already a way to set up online gifting for your child. And it’s pretty easy, once you know where to look. The resource allows friends and families to simply follow a link and electronically deposit funds in your child’s 529. I’m going to walk you through the easy steps to get started. Log into fidelity.com and navigate to your U.Fund Account Dashboard. Once you get there, you’ll see a visual with your financial information. You should also see a short list of links, directly below your summary. Click on the Learn about our College Gifting Service link, which will take you directly to a page where you can learn more about online gifting. On the College Gifting page, you’ll be able to read about the opportunities for your loved ones to contribute to your child’s college education. When you’re ready to set up your page, simply click Sign Up. You’ll first need to read and agree to the terms and conditions. And then you’ll be brought to your personal page. 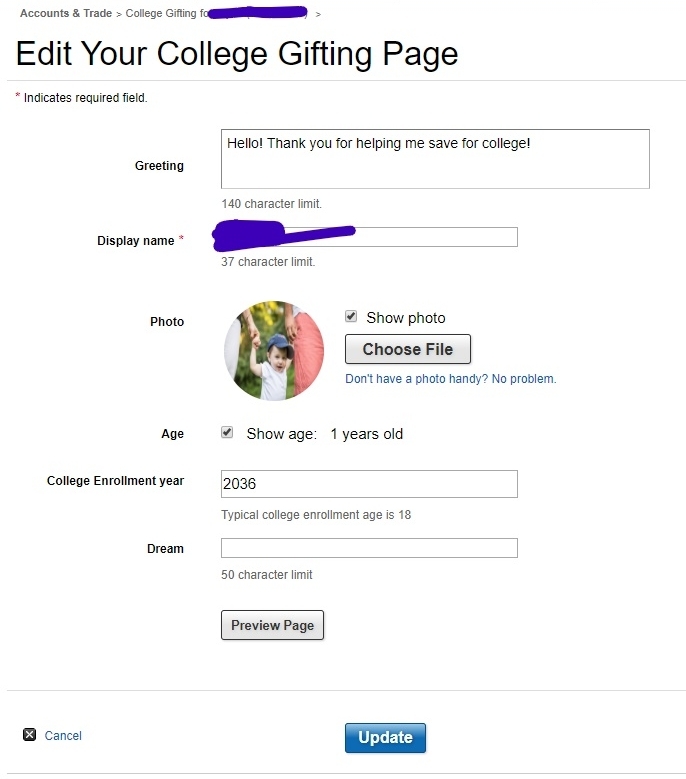 Here, you can edit the greeting, change the display name of your child, upload a photo, and add the year your child is expected to enter college. You can also list your child’s dream for the future! Once this is all complete, click Update to save your changes. 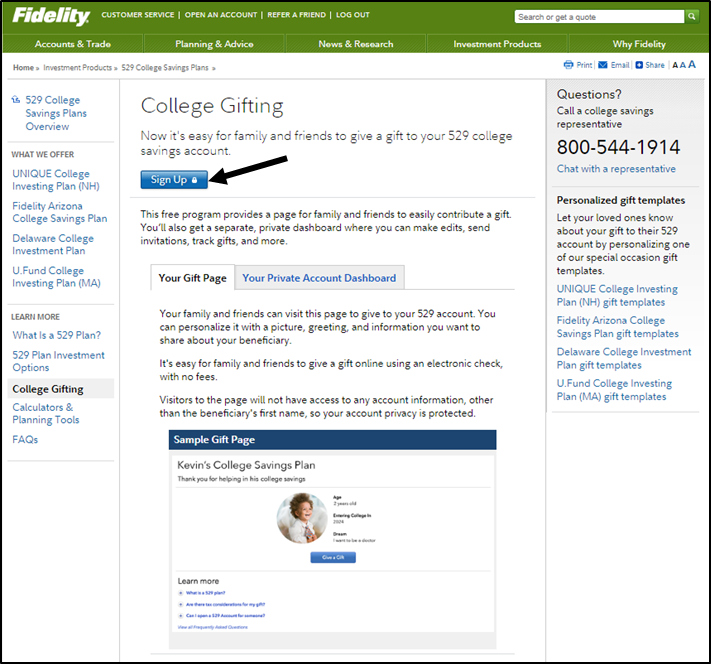 Once your gifting page is set up, you can access it from your Fidelity main account dashboard at any time. Simply click the Go to my College Gifting Dashboard link. 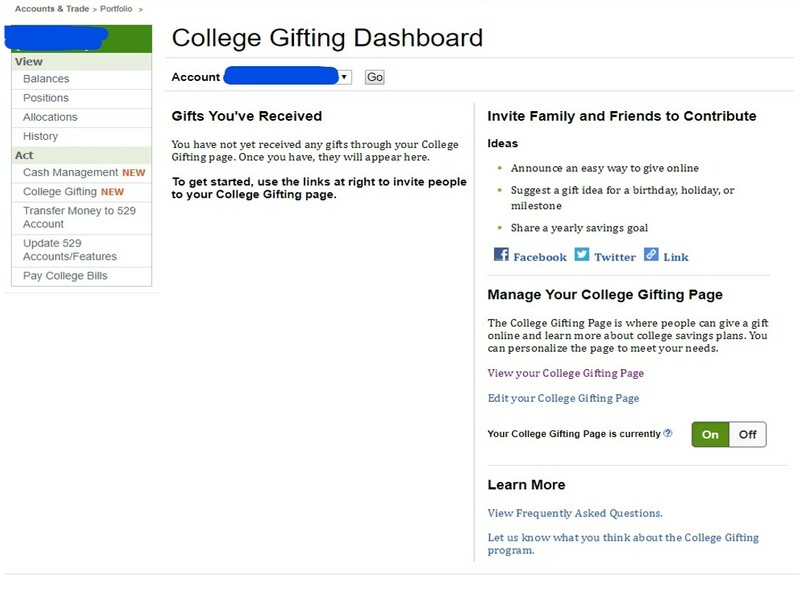 On your College Gifting Dashboard, you can share the link to your gifting page on Facebook and Twitter, and also generate a unique URL to share with family and friends for direct access to your child’s personal gifting page. Transfer your funds by completing Form 8888 using your online tax software, listing the accounts into which you would like your refund deposited, and attaching the form to your federal income tax return.